I can't believe how fast time flies! My daughter and her husband celebrated their one year wedding anniversary on the 28th of September. I still look back on the photo album fairly regularly, and I have a couple of enlargements throughout my home that I see on a daily basis; it was such a special time for our family. I knew I wanted to do a little something as a gift for the two of them....nothing too over-the-top, so I opted to make a wine label to commemorate the day. I used Microsoft publisher since it offers lots of options and I'm just really comfortable with the program since I use it a lot at work. 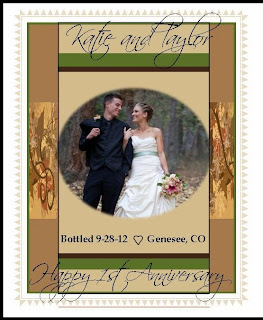 I developed the design as I went along; I knew I wanted to use one of their wedding photos so I used that as my focal point and worked the other design elements around it. Since they were married in the fall, I used the fall colors we used as the theme throughout their wedding. As far as the rest of the project goes, I removed the existing label off the front of the bottle by soaking it really well in water. I suspended it over a bowl, since I wanted to keep the back label. It really came off fairly easily; in three large pieces. I removed the first piece, then re-soaked and pulled off the second piece and one more soak and I was good. I printed the the label on a buff colored resume' paper so it was a bit more sturdy than your standard copy paper. To adhere my label to the front, I used a glue stick. I felt it would cause the least amount of rippling, being more of a dry adhesive. It worked like an absolute charm, it went on so smoothly. I decided to also make a wine bag out of some burlap that I had on hand from another project. I won't share the dimensions since it can vary depending upon the brand of wine you choose (due to the size/shape of the bottle). I serged it on three sides and then stitched a line from the bottom edge to the side in order to eliminate the pointy corners when it was turned right side out. Then, I added some fun embellishments to make it special. I opted for a dessert wine; I thought it would go well with the wedding cake that has been in my freezer all this time. Yup! We saved the top of the cake for them, just like my husband and I did when we got married; and we did eat ours (I don't think I've ever met a cake I didn't like) Happy Anniversary-- Enjoy you two!! I know I've blogged on this topic before, but I decided to write another....Hey it's my blog right? Anyway, maybe I can inspire those of you who also love lapel pins to continue your love affair...and possibly convert some of you who have never been a fan to try it out. These ideas were just waiting to come to life...you see these little beauties were either found in my jewelry box or my Mom's. Cool huh? So, out-of-pocket investment was minimal. The first one is so simple, it's a circa 1980's earring. You see back then, hand painted ceramic earrings were BIG!! in more than one way---Big as in popular and Big as in Big....anyway, I've gotten more compliments when I wear this as a lapel pin. Just take advantage of the existing hardware and push it through the lapel as if it were the hole in your ear lobe and you're golden. The next one I made with old clip on earrings of my Mom's. I was inspired when my daughter and I went digging into Mom's jewelry box for the something "old" for my daughter's wedding. My daughter opted to take a couple of clip-on earrings and a brooch and give them to the florist to place in her bridal bouquet. It was so sentimental. So, when we were rooting around, there were other earrings that I thought were cool and decided to do something with them. I started with the green earrings, then found a few other doo-dads and glued them all together....then, just add either a piece of felt, or in my case I had some suede and glued it to the back and then glued the pin hardware (yep....I got it at Hobby Lobby...my home away from home). There's more fun to be had in the jewelry box, but I moved on to a fabric flower that I wanted to share. This one is made from three types of fabric remnants that I've used in various projects. You cut various size circles and then fold them in half and then in half again.....hand stitch them to a piece of felt or interfacing for support and sew the pin hardware to the back. There are a ton of great tutorials already out there both on blogs or You Tube, so I'm not going to bother you with that.....but look how cute it is! You never know what treasures you have that you can bring to life with a little imagination! Go for it! I had the pleasure of helping a bride with a few items for her wedding day recently. On the gown that she purchased, she wanted to add some custom touches. The first item involved the hemline; she was looking for a more pronounced scalloped lace edging around the perimeter. I was able to find a beautiful wide alencon lace trim at Allyn's Fabrics in Denver which matched beautifully to the gown color. The second item was to add a rhinestone trim (she had purchased) just underneath the bustline; beautiful touch! Finally, so that she could dance the night away with ease, I added bustles. To bustle the gown it took a double bustle with three bustle points in each tier. The upper bustle, since it took the majority of the weight of the gown, I used buttons and loops similar to the other bustle I recently shared with you. The second tier was done with three pairs of ties. For me....anytime I can design and create, I'm in heaven. So, the best part was the elbow length veil she wanted me to create. I used the same scalloped trim from the hemline of the gown for the border of the veil. I chose to make the width of the veil just a bit wider than shoulder width since we wanted to be sure not to obscure the back of her gown. The back bodice of the gown was particularly interesting so by minimizing the width, it left the veil very sheer across her back. Take a look at beautiful Miranda! What was especially cool was I was able to be a part of Miranda and Lance's special day, since I was honored to second shoot alongside KB Digital Designs. Congratulations and may the two of you share many, many years of sweet anniversaries together! 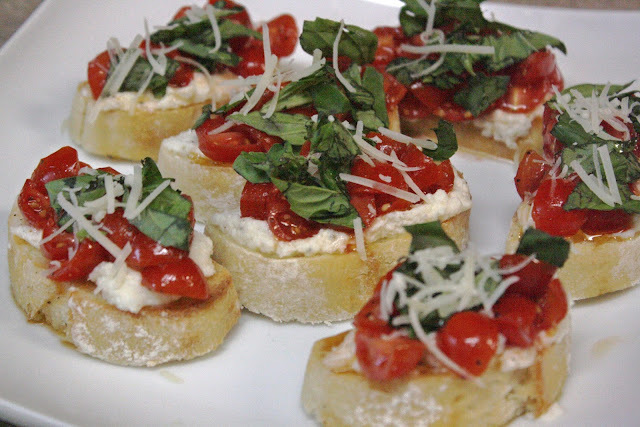 I made these bruschetta this past weekend for hors d'oeuvres before a steak and roast veggie dinner. It took a bit of prep; toasting the bread, chopping up the tomatoes, etc....but it was definitely worth the time. I'd say the prep was about 20-25 minutes. You'll see there is one step with the tomatoes that requires 30 minutes time; I toasted the bread and mixed up the ricotta during that time. I can't take the credit, I found it on Sweet Pea's kitchen; it was so yummy I wanted to share. This gal has a ton of recipes on her blog; there were lots that I thought looked really yummy!! I'll be visiting her site again, for sure. Looks good enough to eat, huh? Enjoy!